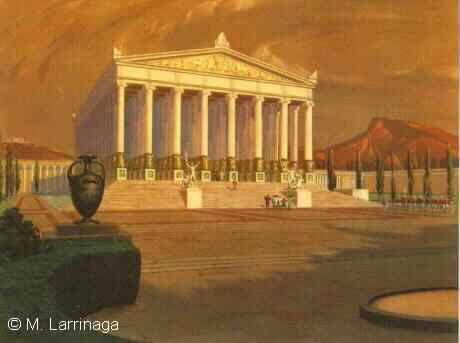 But when I saw the sacred house of Artemis that towers to the clouds, the other Wonders were placed in the shade, for the Sun himself has never looked upon its equal outside Olympus. Although the foundation of the temple dates back to the seventh century BC, the structure that earned a spot in the list of Wonders was built around 550 BC. Referred to as the great marble temple, or temple D, it was sponsored by the Lydian king Croesus and was designed by the Greek architect Chersiphron. It was decorated with bronze statues sculpted by the most skilled artists of their time: Pheidias, Polycleitus, Kresilas, and Phradmon. The temple served as both a marketplace and a religious institution. For years, the sanctuary was visited by merchants, tourists, artisans, and kings who paid homage to the goddess by sharing their profits with her. Recent archeological excavations at the site revealed gifts from pilgrims including statuettes of Artemis made of gold and ivory… earrings, bracelets, and necklaces… artifacts from as far as Persia and India. On the night of 21st July 356 BC, a man named Herostratus burned the temple to ground in an attempt to immortalize his name. He did indeed. Strangely enough, Alexander the Great was born the same night. The historian Plutarch later wrote that the goddess was too busy taking care of the birth of Alexander to send help to her threatened temple. Over the next two decades, the temple was restored and is labeled temple E by archeologists. And when Alexander the Great conquered Asia Minor, he helped rebuild the destroyed temple. When St Paul visited Ephesus to preach Christianity in the first century AD, he was confronted by the Artemis‘ cult who had no plans to abandon their goddess. And when the temple was again destroyed by the Goths in AD 262, the Ephesians vowed to rebuild. By the fourth century AD, most Ephesians had converted to Christianity and the temple lost its religious glamor. The final chapter came when in AD 401 the Temple of Artemis was torn down by St John Chrysostom. Ephesus was later deserted, and only in the late nineteenth century has the site been excavated. The digging revealed the temple ‘s foundation and the road to the now swampy site. Attempts were recently made to rebuilt the temple, but only a few columns have been re- erected. The foundation of the temple was rectangular in form, similar to most temples at the time. Unlike other sanctuaries, however, the building was made of marble, with a decorated facade overlooking a spacious courtyard. Marble steps surrounding the building platform led to the high terrace which was approximately 80 m (260 ft) by 130 m (430 ft) in plan. The columns were 20 m (60 ft) high with Ionic capitals and carved circular sides. There were 127 columns in total, aligned orthogonally over the whole platform area, except for the central cella or house of the goddess.